Remove the steering column cover screws (A), then remove the steering column upper (1) and lower (2) covers. Shown with steering wheel removed for clarity. 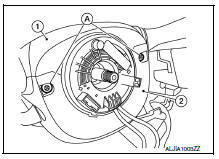 If necessary, rotate steering wheel to access steering column cover screws (A).